I have no words for this bit of awesome. He wore it in a gay pride parade. It’s around the intardwebz somewhere. Actually that was photoshoped…but it did apparently inspire someone to make it really happen. Side-by-side original gay pride pic, and the first photoshopped version. 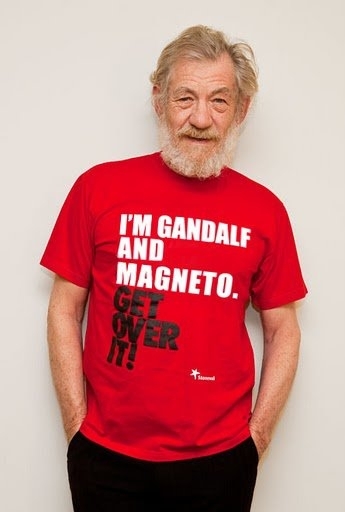 so… someone shops “gandalf” and “magneto” over a gay pride shirt and its post worthy? oh, a year ago. this happened a year ago.. common major spoilers.. really? is this reallllly what is on the top of your page tonight. a year old photoshopped shirt. do some research ffs. Give Stephen a break. You can’t expect everyone to see everything. 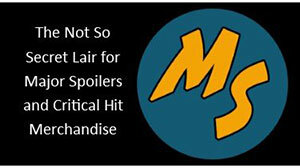 i thought i was checking majorspoilers.com for news. not shitstephenschleicherjustnownoticed.com my bad. Stephen, fantastic image post, I had a good chuckle when I saw it. 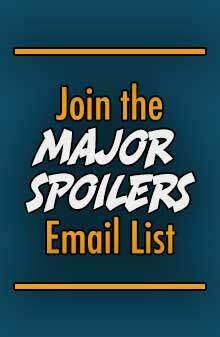 Thanks again Major Spoilers……. Greg Stekelman… thank him. he made it. a year ago. Don’t let the turkeys get you down, Steven. I, for one, got a chuckle from it. 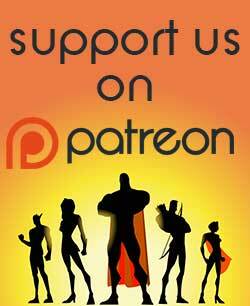 I hadn’t seen it before since I am not in the habit of visiting the sorts of websites mentioned above. because posting a picture someone made .. that turns a real message into a joke btw… never mind. whatever. sorry for coming of rude. i just expect more i guess. sorry if this turkey got you down stephen. i expect this sort of post an old meme pic with a factually inaccurate header and one sentence post from sites like kotaku so i prepare myself to ignore it before i visit. this caught me off guard. Thanks Stephen for making me smile. I love the complete Major Spoilers Experience. I wholly agree with the Canadian (talk about a sentence I didn’t expect to write tonight). ian’s shirt says “some people are gay. get over it” a meaningful statement. something ian clearly feels strongly about since he is gay and wore this to an anti pope rally last year. but feck all that. lets laugh at something that really doesnt even make sense. w/e rampant bout of douchbaggary? laughing at this picture says youre a hipster fuckshit with a poor sense of humor. man is trying to make a statement, all you see is something slightly ironic. kudos to you. Yes, the actual statement that Sir Ian was making is very important and powerful, but that doesn’t make the joke any less funny. Your anger and vitriol regarding this post make it seem like you’re taking it personal that someone made a joke and that another person came late to the party to said joke and wanted to share it. Take a deep breath, relax, and ignore the posts you dislike. You don’t have to insult people just because they liked something you didn’t. its not personal. i just dont get the joke or find it funny at all. i dont understand why its posted. im kinda suprised im the only one questioning why it was posted. its questionably funny at best. could be viewed as offensive if say maybe you were gay and didnt like your message mocked. stephen has no words to describe the picture but should have found enough to maybe actually explain the image.. google it maybe. clearly i have the unpopular stance here so ill just wander off until the next reply calls me a doucheturkey or something of the sort. “Photoshopped or not”… I do not see anything “gay”… Hell, he was Gandalf and Magneto! Get over it! I sent the photo to Stephen. It came from a friend of mine that’s a big fan of LOTR as well as being a supporter of the GLB community. I thought it was funny and so did she and her friends. Last word on that. Thanks, Stephen for having a sense of humor. hmmm Christopher Lee is Count Dooku, Saruman the White and Dracula. Johny Depp is Jack Sparrow, Willy Wonka and Edward Scissorrhands. Patrick Stewarts is Xavier and J-L Picard. Robert Dawney Jr. Is Stark and Sherlock Holmes. Christian Bale is Batman and John Connors.